What happens when a valuable collection of art meant to benefit a certain group of people becomes a liability to those same people. 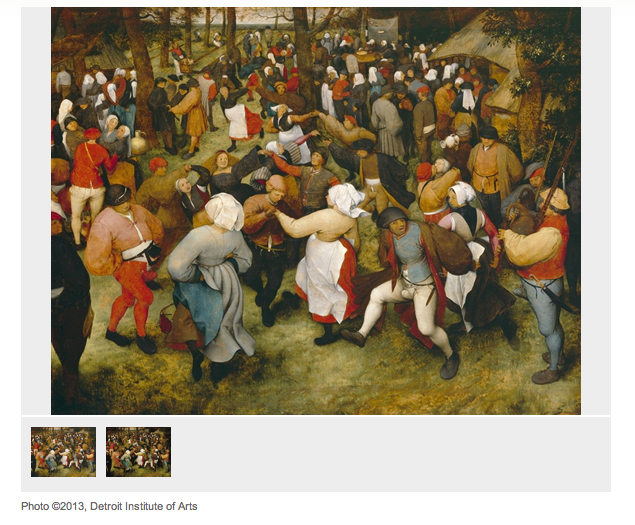 The Detroit Institute for the Arts (DIA) is facing such a dilemma with the city currently in a state of bankruptcy. The same issue came up with the fate of the Alfred Steiglitz Collection bequeathed to Fisk University by Georgia O’Keeffe. Like the city of Detroit, Fisk was facing a financial crisis and an offer had been made to purchase the collection. In an article for the Chicago Tribune (via Art’s Journal), Mark Caro lays out the unique situation of the Detroit Institute for the Arts. It seems the art in Detroit may actually belong to the people and not the institute because of a tax approved by the voters of Detroit and surrounding counties specifically to finance the DIA. Can a collection be sold that belongs to the people? The immediate dilemma is the funding of pensions for retirees versus maintaining the artwork. The lovers of art are hoping a last minute rescue will come charging in on a mighty fire-breathing steed. The retirees are hoping not to be turned out in the cold. And Detroit gets pretty cold! Fisk University was facing a similar crisis. As one of the oldest universities in the United States whose mission is to provide a liberal arts education to “young men and women irrespective of color.” Fisk is well known for the Fisk Jubilee Singers who have been touring throughout the United States and over seas since 1871. Read about their history here. Georgia O’Keeffe’s gift was intended to continue the role of the arts at Fisk. When Fisk fell on hard times several years back, the collection became a liability because of the high cost of maintaining such valuable art. Enter Walmart heiress, Alice Walton offering to buy the entire collection for the Crystal Bridges Museum of American Art in Bentonville. Arkansas. Not exactly a fire-breathing steed but a rescue nonetheless. The problem was O’Keeffe’s will and its stipulations. The New York Times’ Artbeat blog covered the court case. The legal battle produced an amicable decision allowing Fisk to be able to keep the collection but transfer some of the costs of upkeep to The Crystal Bridges Museum in a borrowing of the collection agreement. Emotion runs high when art is caught up in fiscal crisis. Retaining art or survival is a no- brainer to numbers people. But to artists and art-lovers, art is survival. Artists and art lovers know art equals sanity. Hopefully, the decision-makers in Detroit know that too. The search for solutions is ongoing. The call for anyone in possession of a mighty fire-breathing steed has gone out. This entry was posted in art, Uncategorized and tagged Alice Walton, Chicago Tribune, Crystal Bridges Museum of American Art, Detroit, Detroit Institute for the Arts, Fisk, Fisk University, United States. Bookmark the permalink.